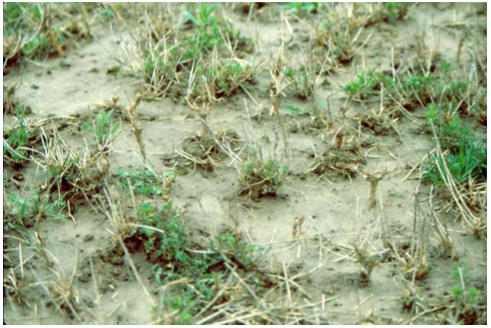 Heaving is a problem in some alfalfa stands each year in the Midwest. Heaving occurs on heavy soils that have high moisture contents. Repeated freezing and thawing causes soil expansion and contraction that pushes the tap-rooted plants (and fence posts) out of the soil. The need to push against something is why grasses with fibrous root systems are not affected by heaving and older alfalfa stands (with larger taprooted plants) are more affected by heaving than younger stands.